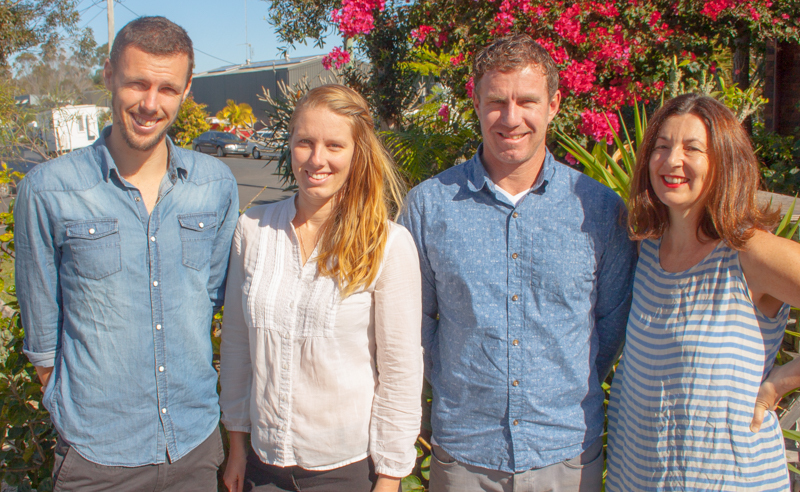 Photo L to R – Ben Mallinson, Caitlin Weatherstone, Byron Rogers and Cate Coorey. The ‘Community Byron’ group is happy to announce our candidacy for the Council elections. The group, led by Cate Coorey – President of Byron Residents’ Group – is made up of all first-time candidates, bringing a new and vibrant energy to the Council fray. Second on the ticket is Ben Mallinson. Ben worked for 5 years as a specialist consultant to architects in Sydney and now lives in Mullumbimby where he is a permaculture student and design consultant. A committee member of Northern Rivers Young Farmers’ Alliance, Ben established the food sovereignty project ‘food4lawns’ in Mullumbimby. “The three ethics I put into action: earth care, people care, fair share. I want to see ethical practice in Council. Freedom of information and transparency of process are the foundations of accountability. A new Council must ensure these foundations are solid – a first step to ending questions about secrecy and corruption,” says Ben. Third on the ticket is scientist and ecologist Caitlin Weatherstone. Caitlin is highly active in the Shire. Currently working for the Byron Bay Surf Festival, she is also establishing an environmental education business. Instrumental in the Plastic Free July campaign, Caitlin has cleaned plastic from beaches on Cape York, undertaken local threatened species surveys and volunteers with several local conservation organisations. “I’m passionate about environmental education and protection in our local community. I will stand for the values of the community in my decision making and will act to represent all Byron Shire locals – human and animal,” says Caitlin. Our number four is Byron Rogers. Born and raised in the region, Byron recently retired after 13 years in the NSW Police Force and is presently studying Building and Construction. He’s surfed Byron’s beaches for over 35 years and is Secretary of the Byron Bay Malibu Club. “I am passionate about retaining the unique character of our local towns and villages and strongly advocate for a decent bypass, bicycle paths and CBD pedestrianised areas to be a priority in the Byron Bay township,” says Byron. Previous Big development at Ewingsdale anyone?